Abu Abdullah Muhammad Ibn Battuta was a Moroccan Muslim scholar and traveler. He was known for his traveling and undertaking excursions called the Rihla. His journeys lasted for a period of almost thirty years, covering nearly the whole of the known Islamic world and beyond. They extended from North Africa, West Africa, Southern Europe and Eastern Europe in the West, to the Middle East, Indian subcontinent, Central Asia, Southeast Asia and China in the East, a distance readily surpassing that of his predecessors. After his travels he returned to Morocco and gave his account of the experience to Ibn Juzay. 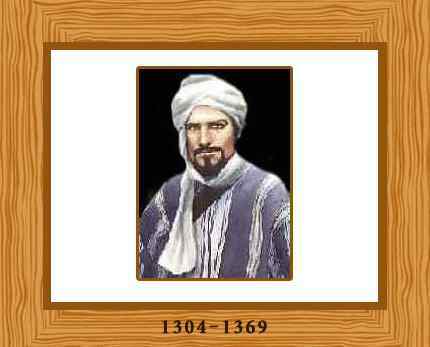 Abu Abdullah Muhammad Ibn Battuta, was born in Tangier, Morocco, on the 24th of February 1304 C.E. (703 Hijra) during the time of the Marinid dynasty. He was commonly known as Shams ad-Din. His family was of Berber origin and had a tradition of service as judges. After receiving an education in Islamic law, he chose to travel. He left his house in June 1325, when he was twenty one years of age and set off from his hometown initially on a hajj (pilgrimage) to Mecca, a journey that took him 16 months. He continued travelling and did not return to Morocco for at least 24 years. His journeys were mostly by land. To reduce the risk of being attacked, he usually chose to join a caravan. In the town of Sfax, he married. During his travels, he survived wars, shipwrecks, and rebellions. He first began his voyage by exploring the lands of the Middle East. Thereafter he sailed down the Red Sea to Mecca. He crossed the huge Arabian Desert and traveled to Iraq and Iran. In 1330, he set of again, down the Red Sea to Aden and then to Tanzania. Then in 1332, Ibn Battuta decided to visit India. He was greeted open heartedly by the Sultan of Delhi. There he was appointed to the position of a judge. He stayed in India for a period of 8 years and then left for China. Ibn Battuta left for another adventure in 1352. He then went south, crossed the Sahara desert, and visited the African kingdom of Mali. Finally, Battuta returned home to Tangier in 1355. It is questionable whether Ibn Battuta visited all the places that he described. In order to provide a comprehensive description of places in the Muslim world, Ibn Battuta probably relied on hearsay evidence and made extensive use of accounts by earlier travelers. Ibn Battuta reported that he experienced culture shock in some of the regions he visited. The local customs of recently converted people did not fit his orthodox Muslim background. Among Turks and Mongols, he was astonished at the way women behaved. They were allowed freedom of speech. He also felt that the dress customs in the Maldives and some sub-Saharan regions in Africa were too revealing. After the completion of the Rihla in 1355, little is known about Ibn Battuta’s life. He was appointed a judge in Morocco and died in 1368. The Rihla provides an important account of many areas of the world in the 14th century.